The ad opens with ominous music–and the face of a snarling Donald Trump. The voice belongs to Tom Moe, a retired colonel in the U.S. Air Force–and a former Vietnam prisoner-of-war. It’s a video produced by the 2016 Presidential campaign for John Kasich. Kasich, the governor of Ohio, has been peddling a message of creating jobs, balancing the Federal budget and disdain for Washington, D.C. But he remains far behind in the polls, dropping 50% in support in just one month–from September to October. Meanwhile, Trump, the New York billionaire developer, is backed by 25% of Republican primary voters. So, with nothing to lose, Kasich has decided to take off the gloves. He’s invoked the “N” word for Republicans: Nazi. “You might not care if Donald Trump says Muslims must register with the government, because you’re not one,” continues Moe. The above is indeed a paraphrase of a famous quote by Martin Niemoeller (1892–1984), a prominent Protestant pastor. Although he had been a U-boat commander during World War 1, he became a bitter public foe of Adolf Hitler. A staunch anti-Communist, he had initially supported the Nazis as Germany’s only hope of salvation against the Soviet Union. But when the Nazis made the church subordinate to State authority, Niemoeller created the Pastors’ Emergency League to defend religious freedom. For his opposition to the Third Reich, Niemoeller spent seven years in concentration camps. With the collapse of the Reich in 1945, he was freed–and elected President of the Protestant church in Hesse and Nassau in 1947. 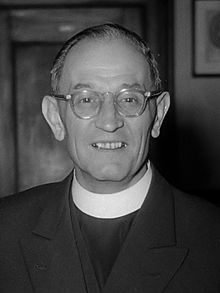 During the 1960s, he was a president of the World Council of Churches. Neither “Adolf Hitler” nor “Nazi Party” was mentioned during the one-minute Kassich video. But Trump is furious. “I will sue him [Kasich] just for fun,” said Trump, if he can find anything “not truthful” within the ad. So says the man who has called Mexican immigrants “rapists” and accused President Barack Obama of being a Muslim and born outside the United States. He had served with the Wehrmacht in Poland (1939), France (1940) and the Soviet Union (1941). While serving in Tunisa, he was seriously wounded on April 7, 1943 when Allied fighters strafed his vehicle. He lost his left eye, right hand and two fingers of his left hand after surgery. For most of these officers, the motive was craven: Germany was losing the war it had launched on the world–and they feared the worst. This was especially true now that the numerically superior forces of the Soviet Union had gone onto the offensive. For Stauffenberg, there was another reason: His disgust at the horrors he had seen committed by his fellow Wehrmacht soldiers upon defenseless POW’s and civilians in Russia. Thus, Stauffenberg–more than many Germans–knew firsthand the vengeance his country could expect if the “1,000 year Reich” fell. Something must be done, he believed, to prove to the world that not all Germans–even members of the Wehrmacht–were criminals. Most of the conspirators wanted to arrest Hitler and surrender to British and American forces–well before the much-feared Russians gained a toehold in Germany. For Stauffenberg, arresting Hitler wasn’t enough. Stauffenberg wanted him dead. A live Hitler might eventually be rescued by his Nazi colleagues. “Thirty years after her death, Ayn Rand’s ideas have never been more important. So reads the jacket blurb for Ayn Rand Nation: The Struggle for America’s Soul, by Gary Weiss. “The timing of this book couldn’t be better for Americans who are trying to understand where in the hell the far-out right’s anti-worker, anti-egalitarian extremism is coming from,” asserts Jim Hightower, New York Times bestselling author of Thieves in High Places. For those who believe that Rand’s philosophy is the remedy for America’s economic and social ills, a 2013 60 Minutes news story sounds a warning. New England Compounding Center (NECC) pharmacy, based in Framington, Massachusetts, is under criminal investigation. The reason: Shipping, in the fall of 2012, 17,000 vials of a steroid to be injected into the joints or spines of patients suffering chronic pain. But instead of relieving pain, this steroid–contaminated with fungal meningitis–brought only agony and death. The vials went out to thousands of pharmacies scattered across 23 states. Forty-eight people have died, and 720 are still fighting horrific infections caused by the drug. Just as Ayn Rand would have wanted, the pharmacy managed to avoid supervision by the Food and Drug Administration (FDA). NECC was one of thousands of pharmacies that Congress exempted from FDA oversight. The reason: By law, they are allowed to make custom drugs for just one patient at a time. But within a few years, NECC went national–and vastly expanded the quantities of drugs produced. “The underlying factor is that the company got greedy and overextended and we got sloppy, and something happened,” John Connolly, a lab technician for the company, told 60 Minutes, the CBS news magazine. And, also as Rand would have wanted, the four family members who founded the pharmacy were enriched by it–receiving over $16 million in wages and profits, from December 2011 through November 2012. Bankruptcy records show the family members racked up $90,000 on corporate American Express credit cards, including charges made after the company shut down in early October. NECC was shut down by the authorities. Barry Cadden, the president and lead pharmacist of the company, was subpoenaed by Congress to testify. In true gangster fashion, he pleaded the Fifth. He claimed he didn’t know how the contamination started. In May, 2015, a federal bankruptcy judge approved the establishment of a $200 million compensation fund for victims of the meningitis outbreak. This would have outraged Ayn Rand, who believed that greed was sacred–and should not be punished, whatever its consequences. Which brings us back to Ayn Rand Nation. Atlas Shrugged–Rand’s 1957 novel–depicts a United States where many of society’s most productive citizens refuse to be exploited by increasing taxation and government regulations and go on strike. The refusal evokes the imagery of what would happen if the mythological Atlas refused to continue to hold up the world. The novel continues to influence those who aren’t hard-core Rand followers, who are known as Objectivists. Ayn Rand’s novels dramatically affirm such bedrock American values as independence, creativity, self-reliance, and above all, a permanent distrust of government. In Rand’s 1936 novel, We the Living–set in Soviet Russia–her heroine, Kira Argounova, tells a Communist: “I loathe your ideals; I admire your methods.” Objectivists believe in defending capitalism with the same ruthless methods of Communists. In Rand’s ideal world, government would control only police, armies and law courts. To her, a government which performs more than these three functions is not simply impractical or expensive: it is evil. Many of those who embrace Rand substitute rage for logic: Tea Partiers are furious about the 2008 Wall Street crash, yet they blame the government for it. Weiss asserts that Tea Party members resent the social and economic realities facing the nation, but lack a coherent intellectual framework to help them focus and justify their rage. But Objectivists have–and offer–such a framework. Thus, Tea Partiers form the ideological part of the right wing, and the clarity–and fanaticism–of their views gives them a power far out of proportion to their numbers. Weiss believes that Rand is presenting a moral argument for laissez-faire capitalism, which means eliminating Social Security, Medicare, public road system, fire departments, parks, building codes–and, above all, any type of financial regulation. Weiss maintains that Rand’s moral argument must be directly confronted–and defeated–with moral arguments calling for charity and rationality. Given the fanaticism of Tea Partiers and the right-wing Republicans they support, success in countering Rand’s “I’ve-got-mine-and-the-hell-with-everybody-else” morality is by no means assured. Contrast this devotion of Crockett to the rights of “the little men,” as Persius Tarr called them, with the attitude of Donald Trump, the currently-favored Republican candidate for President in 2016. Russian President Vladimir Putin is no admirer of President John F. Kennedy. Yet he would no doubt agree with the spirit of the poem that Robert Frost intended to read at Kennedy’s 1961 inaugural. On September 30, Putin embarked on a game of big-power politics. He started launching airstrikes against Syria. The objective: To bolster the dictatorship of Russia’s ally, Syrian President Bashar al-Assad, who is now caught up in civil war. This began on March 15, 2011, triggered by protests demanding political reforms and the ouster of al-Assad. More than 310,000 people have been killed in the fighting. The Obama administration is worried about Russian intentions. And Republicans are furious, demanding that American military forces directly confront those of Russia. Yet despite Right-wing fears about Russia, there is no reason for alarm–by Americans. Putin’s intervention in Syria’s civil war offers three possible outcomes for the United States. And they’re all positive. First, the Russians will kill thousands of America’s sworn enemies. In Syria, they will slaughter everyone who gets in their way. Thus, they will kill far more of America’s Islamic enemies than even our own military–hamstrung by do-gooder “rules of engagement”–could possibly eliminate. Second, Russia will replace the United States as “The Great Satan” in the eyes of most Islamics. Russia’s intervention in Syria will only harden its image as an enemy of Islam–even if it’s supporting one group of Islamics (the Assad regime) against others. If Islamic terrorism starts raging throughout Russia, Putin may be forced to back down from his military moves against Syria and Ukraine. Third, if Russian planes get shot down or Russian soldiers killed, Russia will suffer the casualties–not the United States. And for Russia, the chicken Kiev has already come home to roost. On October 31, Airbus A321, a Russian airliner, broke up in mid-air, then crashed in Egypt’s Sinai Peninsula, killing all 224 people on board. The plane was carrying holidaymakers from the Red Sea resort of Sharm el-Sheikh to St Petersburg when it crashed into a mountainous area of central Sinai. On November 19, ISIS published an online photo of a soft drink can and two components–a detonator and a switch–that it claimed brought down the plane. The crash has proved emotionally wrenching for Russians. Flags across Russia flew at half-staff and Russian Orthodox priests conducted services to pray for the victims. And, on November 24, another such loss occurred: A Russian fighter was shot down on the Turkish-Syrian border by two Turkish F-16s. Turkish officials claimed that it had violated Turkish airspace 10 times within a five-minute period. This marked the first time in a half-century that a member of NATO–in this case, Turkey–has downed a Russian plane. With the armed forces of so many Great Powers–France, Russia, Britain and America–now crowding into Syria, such an outcome was probably inevitable. It was exactly that scenario–Great Powers going to war over conflicts involving their small-state allies/clients–that triggered World War I. A conflict between Russia and Turkey–a member of NATO–could easily trigger World War III. January 26, 2015, marked the 130th anniversary of the fall of Khartoum, the Sudanese city that sits on the banks of the White Nile and the Blue Nile. From March 18, 1884 to January 26, 1885, the charisma and military genius of one man–British General Charles George Gordon–held at bay an army of thousands of fanatical Islamics intent on slaughtering everyone in the city. By comparison:The defenders of the Alamo–a far better-known battle, in 1836–numbered no more than 250. And the siege of the San Antonio mission lasted only 13 days against an army of about 2,000 Mexicans. Gordon’s story may seem antiquated. But it bears close inspection as Republicans press the Obama Administration to commit ground forces to “freeing” Syria of its longtime dicator, “President” Bashar al Assad. Suddenly, American soldiers found themselves waging a two-front war in the same country: Fighting an Iraqi insurgency to throw them out, while trying to suppress growing sectarian warfare between Sunnis and Shia Muslims. On the one side, is the Ba’ath regime of Bashir al-Assad, supported by Russia, Iran, Hizbullah, and elements in the Iraqi government. Hizbollah is comprised of Shiite Muslims, who form a minority of Islamics. It is intolerent of non-Sunni Muslims and has instigated violence against them. It denounces them as “takfirs”–heretics–and thus worthy of extermination. Americans had a good reason to welcome the coming of 2014: Al-Qaeda and Hezbollah had gone to war–with each other. This is an event the United States could not have predicted or instigated. But it is definitely one in which Americans can take hope. Third, the United States is still fighting a brutal war in Afghanistan. Following the 9/11 attacks on New York and Washington, D.C., the Taliban was ousted in Afghanistan by American and Afghan forces in 2001. The initial goal of this war was to quickly destroy Al Qaeda–especially its leader, Osama Bin Laden–and its Taliban protectors. But, over time, Washington policy-makers embarked on a “nation-building” effort. And U.S. forces wound up occupying the country for the next ten years. The United States originally intended to withdraw all but a small embassy-based force of 1,000 troops by the end of 2016. But as the Taliban re-emerged as a threat, President Barack Obama announced he would maintain 9,800 troops there for most of 2016. About 5,500 troops will still be in Afghanistan by 2017. Fifth, since 1979, Syria has been listed by the U.S. State Department as a sponsor of terrorism. Among the terrorist groups it supports are Hezbollah and Hamas. For many years, Syria provided a safe-house in Damascus to Ilich Ramírez Sánchez–the notorious terrorist better known as Carlos the Jackal. Sixth, according to U.S. defense reports, Syria has weapons of mass destruction–and the ballistic missiles to deliver them. Syria has an active chemical weapons program, including significant reserves of the deadly nerve agent sarin. The recent destruction of much of Syria’s WMD stockpile–at the demand of President Barack Obama–doesn’t erase its ability to create more. And this is likely to re-occur as soon as the United States becomes preoccupied with other concerns. Seventh, the United States had no part in creating the Assad regime. Thus, Americans have no moral obligation to support those Syrians trying to overthrow it. Moreover, Syria has never been an American ally–and has, in fact, directed terrorism against American forces stationed in Beirut, Lebanon. On October 23, 1983, Syrian suicide bombers drove trucks into two buildings housing American and French military forces. Total killed: 299. In short, the United States owes Syria nothing. Eighth, China and Russia are fully supporting the Assad dictatorship–and the brutalities it commits against its own citizens. This reflects badly on them–not the United States. America should focus world outrage against these longtime brutal dictatorships for propping up another one. Ninth, the United States could find itself in a shooting war with Russia and/or China. The Russians sent two warships to Syria in 2013 in response to President Obama’s threat to “punish” Assad for using chemical weapons against insurgents. What happens if American and Russian warships start trading salvos? Or if Russian President Vladimir Putin orders an attack on Israel, in return for America’s attack on Russia’s ally, Syria? Tenth, while Islamic nations like Syria and Egypt wage war within their own borders, they will lack the resources–and incentive–to launch attacks against the United States. Every dead Hezbollah and Al-Qaeda member makes the United States that much safer. Every dead supporter of Hezbollah or Al-Qaeda makes the United States that much safer. When Al-Qaeda blows up civilians in Beirut, it’s certain that their relatives will urge Hezbollah to take brutal revenge. And it’s equally certain that Hezbollah will do so. Similarly, when Hezbollah does, those who support Al-Qaeda will demand even more brutal reprisals against Hezbollah. For Germany’s Fuhrer, Adolf Hitler, it was a major setback. He was forced to concede that he lacked the strength to destroy the British air force–thus making it possible for his navy to land German troop on English soil. But Hitler wasn’t prepared to give up. He believed he could so terrorize Britons that they would demand that their government submit to German surrender demands. “London can take it” went the British slogan. But, in the United States, Americans–including President Franklin D. Roosevelt–wondered: For how much longer? Hitler had turned on his partner-in-crime. The two dictators had greedily split Poland between them when Hitler launched his invasion on September 1, 1939. Today the United States faces just such an opportunity. In Syria, two of America’s most deadly enemies are now waging war–with each other. On one side is the Ba’ath regime of Bashir al-Assad, whose allies include Russia, Iran, Hezbullah, and elements in the Iraqi government. On the other side are a host of Syrians and thousands of foreign Sunni fighters some of whom have affiliated with Al-Qaeda. And now that civil war has spread into neighborhing Lebanon. On January 2, 2014, at least four people were killed and 77 injured when a car bomb exploded in a residential neighborhood in southern Beirut. The Shiite-dominated district, Haret Hreik, is known as a Hezbollah stronghold. Two days later, an Al-Qaeda linked group claimed responsibility for the attack. That is entirely the wrong way to view this conflict. There are solidly practical reasons why the United States should avoid this bloodfest–while cheering on each of its mortal enemies to do its worst. First, the United States only recently disengaged from Iraq. On Dec. 15, 2011, the American military formally ended its mission there. The war–begun in 2003–had cost the lives of 4,487 service members, with another 32,226 wounded. Second, the war in Iraq fell victim to the law of unintended consequences. The Bush administration invaded Iraq to turn it into a base–from which to intimidate its neighboring states: Jordan, Saudi Arabia, Kuwait, Turkey, Syria and Iran. But while Saddam Hussein’s Iraq had been a counter-weight to the regional ambitions of Iran, the destruction of the Iraqi military created a power vacuum. Into this–eagerly–stepped the Iranian mullahs. According to Micheal Scheuer, America needs to end its role as Israel’s permanent bodyguard. For decades, the United States has pursued two policies in the Middle East, one based on relations with the Arab world and the other based on relations with Israel. Policy 1: Maintaining access to vast amounts of Arab oil at low prices. Policy 2: Maintaining the security of Israel. Since the Arabs and Israelis hate each other, each side constantly tries to sway American support in its direction. Every step the United States takes to defend Israel–diplomatically or militarily–ignites hatred of Americans among Islamics. President George W. Bush tilted strongly toward Israel. That convinced Israelis to go on building settlements in occupied Arab territory–and alienated the Arabs. President Barack Obama, seeking a balanced approach, leaned heavily on Israel to stop building settlements. Israel has continued doing so–thus alienating the Israelis while leaving the Arabs enraged. In short: The United States is like a giant who has one foot stuck in Israel and the other stuck in any Islamic country–leaving his private parts fully exposed to whichever side wants to take a shot at them. This is not to deny that Israel has a right to exist. Every nation--including Israel–has the absolute right to defend itself from aggression. But no nation–including Israel–should have the right to expect another nation to act as its permanent bodyguard. Millions of Americans believe they are morally obligated to defend Israel owing to the barbarism of the Holocaust. America, however, was never a party to this, and has nothing to atone for. This is also the view of many Right-wing members of the House of Representatives and Senate. Clearly, people who hold such totally irrational views shouldn’t be allowed to hold public office. SCHEUER: These people are fighting for something substantive, for something religious. ….They are not going to fight us because we have women in the workplace. That is an insanity. What they are fighting us about is what we do. …I would draw your attention to the reality that, to the best of my knowledge, neither we nor any of our NATO partners have yet to capture a Western Islamist fighter whose words or documents have shown a motivation to attack based on hatred for liberty, elections or gender equality. Invariably, they attribute their motivation to U.S. and Western military intervention and support for Israel and Muslim tyrannies. Scheuer’s take on Israel brought him into direct conflict with Rep. Peter T. King (R-New York). KING: I would just say we would have more dead Americans if we didn’t stand by our allies in the Middle East. We would just be encourage al-Qaeda to take advantage of us. SCHEUER: You know, you are presiding over a bankruptcy. What can be worse? What has been the goal of al-Qaeda since it was formed? To bankrupt the United States. Who is winning today, sir? We are done like dinner. KING: We are winning and we will continue to win unless we take the advice of people like you. SCHEUER: Sir, you are exactly wrong. We are losing. Two U.S. field armies were defeated by men in the field with weapons from the Korean War. KING: The fact is we have not been successfully attacked since September 11. SCHEUER: The fact is, sir, we have had two military defeats overseas, which is far more important. And, warns Scheuer, more defeats–domestic and international–lie ahead unless the United States radically changes its policies toward the Middle East. For America to avoid permanent military entanglements in the Middle East, it must learn to mind its own business. So says Michael Scheuer, a 20-year CIA veteran who, from 1996 to 1999, headed Alec Station, the CIA’s unit assigned to track Osama bin Laden at the agency’s Counterterrorism Center. Scheuer has repeatedly warned: The United States must not deploy troops in Syria. More than 310,000 people have been killed in Syria’s uprising-turned-civil war. The conflict began on March 15, 2011, triggered by protests demanding political reforms and the ouster of dictator Bashar al-Assad. And many members of Congress are demanding that “we must do something” to stop all that killing. Fourth, the Assad regime is backed by–-among others–the Iranian-supported terrorist group, Hezbollah (Party of God). Its enemies include another terrorist group–Al Qaeda. Hezbollah is comprised of Shiite Muslims. A sworn enemy of Israel, it has kidnapped scores of Americans suicidal enough to visit Lebanon and truck-bombed the Marine Barracks in Beirut in 1983, killing 299 Americans. Fifth, intervening in Syria could produce unintended consequences for American forces–and make the United States a target for more Islamic terrorism. President Obama has repeatedly said American warplanes are targeting the Islamic State of Iraq and the Levant (ISIL). But bombing is never as accurate as its proponents insist. An accidental American strike on Syrian government forces could lead the country’s dictator, Bashar al-Assad, to attack Israel–perhaps even with chemical weapons. Assad could do this simply because he hates Jews–or to lure Israel into attacking Syria. If that happened, the Islamic world–which lusts to destroy Israelis even more than “apostate” Muslims–would rally to Syria against the United States, Israel’s chief ally. Sixth, the United States cannot defeat ISIL through air power alone. President Barack Obama authorized airstrikes against ISIL in September, 2014. Since then, the United States Air Force has dropped thousands of bombs on ISIL convoys. This was in fact predictable. Air power alone failed to secure victory over Nazi Germany during World War II and Vietnam during the Vietnam war. Nor did it “shock and awe” the Iraqis into surrendering during the 2003 Iraq war. Seventh, while Islamic nations like Syria and Iraq wage war within their own borders, they will lack the resources to launch attacks against the United States. Eighth, China and Russia are fully supporting the Assad dictatorship–-and the brutalities it commits against its own citizens. Any move by the United States to directly attack the Assad regime could ignite an all-out war with Russia and/or China. What happens if American and Russian forces start trading salvos? Or if Russian President Vladimir Putin orders an attack on Israel, in return for America’s attack on Russia’s ally, Syria? It was exactly that scenario–Great Powers going to war over conflicts between their small-state allies–-that triggered World War l.
Ninth, America’s past efforts in the Middle East have usually gone horribly awry. Iran: Mohammad Mosaddegh was the democratically elected prime minister of Iran from 1951 until 1953. His decision to nationalize the Iranian oil industry led to his overthrow in a CIA coup. He was replaced by Shah Mohammad Reza Pahlavi, who ruled until 1979 when a national upheaval forced him to flee. Iranians have never forgiven the United States for subjecting them to the 25-year reign of a brutal despot. Afghanistan: In 1979, the Soviet Union invaded Afghanistan. America began supplying shoulder-fired Stinger anti-aircraft missiles to the Afghan Mujahideen fighters. These shifted the balance of the war to the Afghans, who brought down countless Soviet airplanes and helicopters. Deprived of air supremacy, the Soviet army lost 14,453 killed and 53,753 wounded, and withdrew by 1989. Americans congratulated themselves on their Realpolitic. But many of the Stingers remained in the hands of jihadists–who decided that America was now “The Great Satan.” One of those jihadists: Osama bin Laden. And he’s convinced that if America wants peace, it must learn to mind its own business. In an appearance on 60 Minutes, Obama spoke about his recent decision to commit American troops to fighting the Islamic State of Iraq and the Levant (ISIL). Steve Kroft: I mean, it looks like we are doing 90%. President Obama: Steve…when there’s an earthquake in Haiti, take a look at who’s leading the charge making sure Haiti can rebuild. That’s how we roll. And that’s what makes this America. Scheuer believes that this mindset shouldn’t be what “makes this America.” And that the place to start is by not deploying troops to Syria. First, since 1979, Syria has been listed by the U.S. State Department as a sponsor of terrorism. Among the terrorist groups it supports are Hizbollah and Hamas. For years, Syria provided a safehouse in Damascus to Ilich Ramírez Sánchez–-the notorious terrorist better known as Carlos the Jackal. Second, there are no “good Syrians” for the United States to support–-only murderers who have long served a tyrant and other murderers who now wish to become the next tyrant. Carl von Clausewitz, the Prussian military theorist, wrote: “War is the continuation of state policy by other means.” But President Barack Obama hasn’t stated what his “state policy” is toward Syria–or what he intends to gain by attacking it. Obama has said he’s “not after regime-change.” If true, that would leave Assad in power–-and free to go on killing those who resist his rule.